There are alarm bells ringing in different parts of the world about the disappearance of wild bees. In India we still have them, and it is important to realize their contribution to our food security. For many urbanites honey bees are associated with the painful sting and hence, are insects to keep away and be kept away as far as possible. That they should be kept away from gardens and parks is an attitude we must change. The unique relationship between pollinators and flowering plants has been evolving for over 100 million years and there are currently estimated to be around 200,000 different species of animal worldwide acting as pollinators. These include beetles, bats, flies, wasps, birds, butterflies, moths and some mammals; but it is without doubt the humble bee that does the lion’s share of the work. Bees also pollinate over 80% of the world’s wild flowers and, interestingly, whilst great attention is always given to the bee’s role as our main crop pollinator, we would do well to note that they play an equally important role as ‘keystone species’ in the planet’s eco-systems. 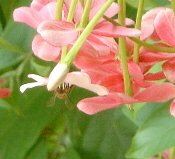 The above beehive was formed on the Glory Bower Creeper. Beehives can be found on Anaar trees, Silk Cotton trees etc. too. Bees can be an integral part of any garden or Park. They do not attack unless their beehive is disturbed. The above photo is the beehive when it has outlived its utility. Observing how and when bees collect honey from flowers in the garden is revealing. Bees seem to keep time based on the rays of sunbeam falling on the beehive and on the flowers from where they collect honey and in the process help pollinate. 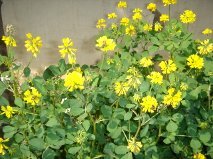 The Madhu Malti flowers are a treat for the honey bees too.